Vilijam Tomson, 1. baron Kelvin (engl. William Thomson, 1st Baron Kelvin; Belfast, 26. jun 1824 — Largs, 17. decembar 1907) je bio britanski teorijski fizičar, koji je razvio Džulovo shvatanje o pretvaranju toplote u mehanički rad. Pronašao je galvanometar sa ogledalom za primanje telegrafskih signala. U njegovu čast jedinica Međunarodnog sistema mera za temperaturu dobila je ime Kelvin (K). Npr. tačka mržnjenja vode 0 °C = 273 K.
Buchwald, J.Z. (1977). "William Thomson and the mathematization of Faraday's electrostatics". Historical Studies in the Physical Sciences 8: 101–136. doi:10.2307/27757369. Burchfield, J.D. (1990). Lord Kelvin and the Age of the Earth. University of Chicago Press. ISBN 0-226-08043-9. Cardoso Dias, D.M. (1996). "William Thomson and the Heritage of Caloric". Annals of Science 53 (5): 511–520. doi:10.1080/00033799600200361. Chang, H. (2004). Inventing Temperature: Measurement and Scientific Progress. Oxford University Press. ISBN 0-19-517127-6. Gooding, D. (1980). "Faraday, Thomson, and the concept of the magnetic field". British Journal of the History of Science 13 (2): 91–120. doi:10.1017/S0007087400017726. Gossick, B.R. (1976). "Heaviside and Kelvin: a study in contrasts". Annals of Science 33 (3): 275–287. doi:10.1080/00033797600200561. Gray, A. (1908). Lord Kelvin: An Account of His Scientific Life and Work. London: J. M. Dent & Co.
Green, G. & Lloyd, J.T. (1970). Kelvin's instruments and the Kelvin Museum. Glasgow: University of Glasgow. ISBN 0-85261-016-5. Kargon, R.H. & Peter Achinstein (eds.) (1987). Kelvin's Baltimore Lectures and Modern Theoretical Physics; Historical and Philosophical Perspectives. Cambridge Massachusetts: MIT Press. ISBN 0-262-11117-9. King, A.G. (1925). Kelvin the Man. London: Hodder & Stoughton. King, E.T. (1909). Lord Kelvin's Early Home. London: Macmillan. Knudsen, O. (1972). "From Lord Kelvin's notebook: aether speculations". Centaurus 16: 41–53. Bibcode:1972Cent...16...41K. doi:10.1111/j.1600-0498.1972.tb00164.x. Lekner, J. (2012). "Nurturing genius: the childhood and youth of Kelvin and Maxwell" (PDF). New Zealand Science Review. Lindley, D. (2004). Degrees Kelvin: A Tale of Genius, Invention and Tragedy. Joseph Henry Press. ISBN 0-309-09073-3. McCartney, M. & Whitaker, A. (eds) (2002). Physicists of Ireland: Passion and Precision. Institute of Physics Publishing. ISBN 0-7503-0866-4. May, W.E. (1979). "Lord Kelvin and his compass". Journal of Navigation 32: 122–134. doi:10.1017/S037346330003318X. Munro, J. (1891). Heroes of the Telegraph. London: Religious Tract Society. Murray, D. (1924). Lord Kelvin as Professor in the Old College of Glasgow. Glasgow: Maclehose & Jackson. Russell, A. (1912). 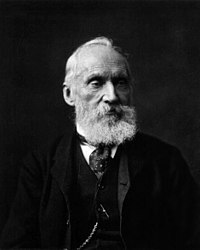 Lord Kelvin: His Life and Work. London: T.C. & E.C.Jack. https://archive.org/stream/lordkelvinhislif00russ#page/n5/mode/2up. pristupljeno 25 March 2014. Sharlin, H.I. (1979). Lord Kelvin: The Dynamic Victorian. Pennsylvania State University Press. ISBN 0-271-00203-4. Smith, C. & Wise, M.N. (1989). Energy and Empire: A Biographical Study of Lord Kelvin. Cambridge University Press. ISBN 0-521-26173-2. http://books.google.com.au/books?id=2JYWeyAXpHUC&pg=PR7#v=onepage&q&f=false. pristupljeno 25 March 2014. Tunbridge, P. (1992). Lord Kelvin: His Influence on Electrical Measurements and Units. Peter Peregrinus: London. ISBN 0-86341-237-8. Wilson, D. (1910). William Thomson, Lord Kelvin: His Way of Teaching. Glasgow: John Smith & Son. Wilson, D.B. (1987). Kelvin and Stokes: A Comparative Study in Victorian Physics. Bristol: Hilger. ISBN 0-85274-526-5. Ovaj članak o naučniku je u začetku. Možete pomoći Wikipediji tako da ga proširite. Ova stranica je zadnji put izmijenjena 00:42, 23 juni 2015.